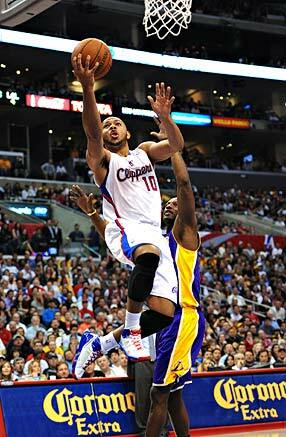 LOS ANGELES -- It was if the Lakers viewed the Clippers as an inconvenience instead of an opponent. Phil Jackson didn't even bother to wear a tie. Left it at home, he said. And Lamar Odom's umbrage that Blake Griffin continued to be aggressive in the waning seconds of a game the Clippers had in hand resulted in a tussle that got four players ejected. The Clippers are not an afterthought anymore. They've established an identity that goes beyond that. They're a young team that's capable of beating anyone in the league if they stick to their roles: Eric Gordon knocking down shots, Baron Davis setting up teammates, DeAndre Jordan rebounding and Blake Griffin ... being Blake Griffin. Yes, the Clippers had more to gain from this than the Lakers, since the Clippers were the only ones with a chance to score a victory over one of the league's best teams. But that's something at which the Clippers have proved particularly adept -- even better than the Lakers. Sunday's 99-92 victory meant the Clippers can say they've beaten the top three teams in the West (along with San Antonio and Oklahoma City) and can also claim victories over two of the top three teams in the East (Miami and Chicago). If not for Derek Fisher's last-second layup on Dec. 8 the Clippers would have two victories over the Lakers this season. The Clippers got this one despite the Lakers' height advantage. They did it despite playing a "home" game in a Staples Center that featured more gold jerseys and louder cheers for the Lakers than the team in white. The Clippers even withstood Kobe Bryant going all veteran on them in the third quarter, when he scored a point for each of his 14 full seasons in the NBA. There's a sense the Clippers have a base, something they can rely on when things get tough. They were down by six midway through the fourth quarter, but scored 21 of the final 27 points of the game. "It was guys driving and kicking, hitting the open man," Gordon said. "We just stuck to it when times get tough." The Clippers are unusual in that Gordon is their leading scorer, but he's not their most identifiable player. He had 30 points and six assists Sunday, but had only three reporters in front of his locker, while the crowds were two-deep around Griffin and Davis. Odom's initial reaction showed how the Lakers were looking for an early checkout and had no interest in battling to the buzzer. "I understand during the game, when we're fighting for position," Odom said. "But they're up 9 with five seconds left. You're going to ram me in my back ... I mean, it was a bad reaction [on Odom's part], but, you know, not at that time." Later he added, "I don't know what you're going to get out of that ram in the back, in that situation." "There's never a situation when I'm not going to go to the glass," Griffin said. "I would think of all the people, he would know that. I would expect the same thing from anybody else. I don't care if we're up. If the ball comes off, I get the rebound, it seals the game." If you've watched Griffin, you know that's his style. And if you've watched the Clippers, winners of nine of their past 12, you know that as of late they play winning basketball, no matter how much it infringes on their opponents' plans. CHICAGO -- The last time the Heat were carrying a three-game losing streak, their coach was under public fire, LeBron James and Dwyane Wade didn't look as though they were meshing at all and the team was barely in one of the Eastern Conference's playoff positions. There were no such feelings this time around as the Heat headed home from a road trip that turned disappointing after three consecutive losses, including a 99-96 setback to the rival Bulls on Saturday night. Unlike in November, when the Heat were barely above .500, the situation has tangible explanations, including injuries to James and Chris Bosh. And unlike two months ago, there are a few positives coming out of the losses. Not everything is peachy. The Heat have areas they must address, with the challenging Hawks coming to Miami on Tuesday. But some positives from the past several games actually may have the team better off in some ways than before the losing streak began. "I'm proud of my team," Wade admitted in defeat Saturday after his 33 points weren't enough against Derrick Rose's heroics. "You look at some of the things the guys did with Chris going down and LeBron, that is what we need when those guys get back in the lineup, to have that confidence." Zach Harper, TrueHoop Network bloggers and fans gave their in-game opinions throughout Sunday's slate of NBA games in Daily Dime Live. It's tough to tell what has taken longer: the construction of the Nets' arena in Brooklyn or the completion of this long-discussed trade to acquire Carmelo Anthony. At least, after years of legal delays, we can see the Barclays Center going up. I chatted with Nets CEO Brett Yormark about what the arena means to Brooklyn, why the Nets need a superstar, the building of the brand and a man he calls Michael -- that would be Mikhail Prokhorov. "I've been engaged in this whole move for about six years," Yormark said. "I'm in Brooklyn quite often, if not daily. The disbelief that the Dodgers left [in 1957], that underserved nature with respect to sports and entertainment, has been passed on from generation to generation. "Brooklyn has the fourth-largest population in the United States. Kids that are growing up will have something to root for. "The first-level concourse is being erected. Steel's coming out of the ground. It's very tangible. We're no longer preaching the gospel. Within time, world-class entertainment and sports will be in Brooklyn." Eric Gordon, Clippers: Dropped in 30 points on 13-of-20 shooting (along with 4 steals and 6 dimes) in the Clippers' win over the Lakers. He's showing his Team USA form in the NBA now, and the Clippers are reaping the benefits. Derek Fisher, Lakers: No buzzer-beater this time. Fish spends 30 minutes on the floor, making 1 of 8 shots while dishing but two dimes. Of course, this just means he's saving up a series of big shots for when it really counts. Steve Nash, during a tweet marathon on his healthy diet, possibly trying to tweet-nag Suns teammate Jared Dudley from enjoying too much New York cuisine before an MLK matinee game. "It was just a bunch of lollygagging and arguing, but it wasn't nothing. It was just playing tag." WALTHAM, Mass. -- Boston Celtics forward Kevin Garnett and center Kendrick Perkins participated fully in Sunday's practice, marking the first time this season that Boston's familiar starting five were reunited with both Garnett and Perkins back on the floor alongside Paul Pierce, Rajon Rondo and Ray Allen. It was a morale boost for the injury-plagued squad. "You could just see it with our first unit -- today was the first time this year we had our real first unit on the floor," coach Doc Rivers said. "Offensively and defensively, it was just another level. They could run anything they wanted because everyone knew where everyone else was at." Clippers guard Eric Gordon gave his team an offensive boost against the Lakers during a 99-92 victory on the Clippers' floor. Cameron (Galesburg, IL): Could you address some of what's going on with this prom-date rumor mill swirling about Carmelo, the Knicks don't want me, I don't want to go to the Knicks, and the Knicks saying, "We want you. Who said we never wanted you?" Ric Bucher: Let's get this straight: Melo wants to go to the Knicks, or, more precisely, wants to be in New York. The Nets can offer that, but not until 2012, which seems like a long ways away for him. If they were there now, the Nets and Knicks would be on equal footing. Melo has been coy throughout this process and his comments about the Knicks not wanting him were just more of the same. Of course the Knicks want him -- but if they can get him this summer, rather than turning their season sideways and having to give up assets, they'd prefer to do that.